Sometimes, when darkness overcomes the light, a hero must rise to fight back the darkness. These Deluxe Hero Bracers are a sign of a true hero, featuring all the detailing and appearance of a true heros shield, symbolically worn on a heros arms. These bracers are similar in nature to our Heros Bracers (DK6061), differing only in that these feature much more detailing. 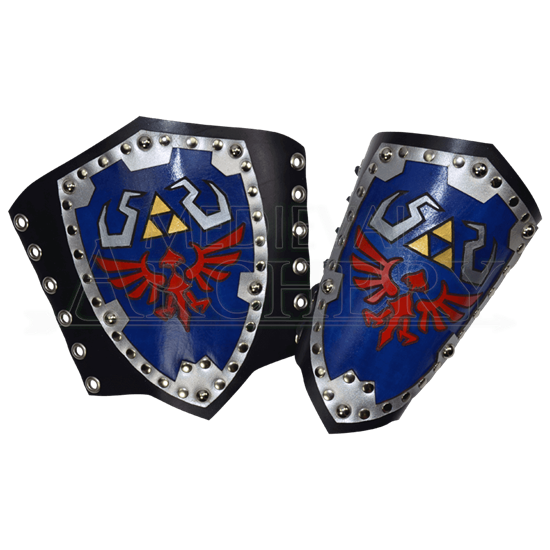 Like the original, these bracers feature a fantasy-based shield design that consists of a silver riveted and studded edge, with an azure blue field at the shields center. On this blue field, however, many more details and colors can be seen. Of course, the classic sacred icon, consisting of three triangles, remains in gold, although now it is accented by a thin black border. Flanking the sacred icon are two twisted line patterns in brushed silver-blue color. Beneath this impressive design lies a great red bird, its wings spread out in a regal display of power and majesty. The left and right sides of the bracer feature lacers, through which a leather lace is passed and pulled right to secure the bracers around the forearm for a tight, secure, and yet comfortable fit. The bracers are handcrafted from 7/8 oz. leather right here in the USA, and are made to withstand use, both as a costume addition and as a LARP accessory. Our Deluxe Hero Bracers will make you feel like a hero out of some distant land, no doubt off to battle hordes of evil minions to save the land, rescue the captured princess, and defeat a dark warlord or sorcerer who brought corruption and shadow onto the land.